This dish was actually my breakfast one morning. Most people don’t think of eating veggies for breakfast, but I often have them and enjoy them immensely. A heavy first meal does not work for my tender digestion, so veggies set me up great for the day. As you can see this tantalizing dish contains a variety of veggies. When you have a variety of small amounts of left over veggies, that is the perfect time to steam them all together. Or, you could be more intentional and buy a few of your favorites, then rustle up different combinations for breakfast, lunch and dinner. Ground sesame seeds, Barlean’s High Lignan flax oil, and Celtic Sea Salt. If you don’t have sesame seeds or flax oil, drizzle a little olive oil on top, or pasture butter. Trust me, you will love it! Don’t forget your cultured vegetables! Learn how to revolutionize your life with the new “4-Week Dietary Makeover”, an online course that delivers a dynamic approach for a dietary lifestyle like the Centenarians. 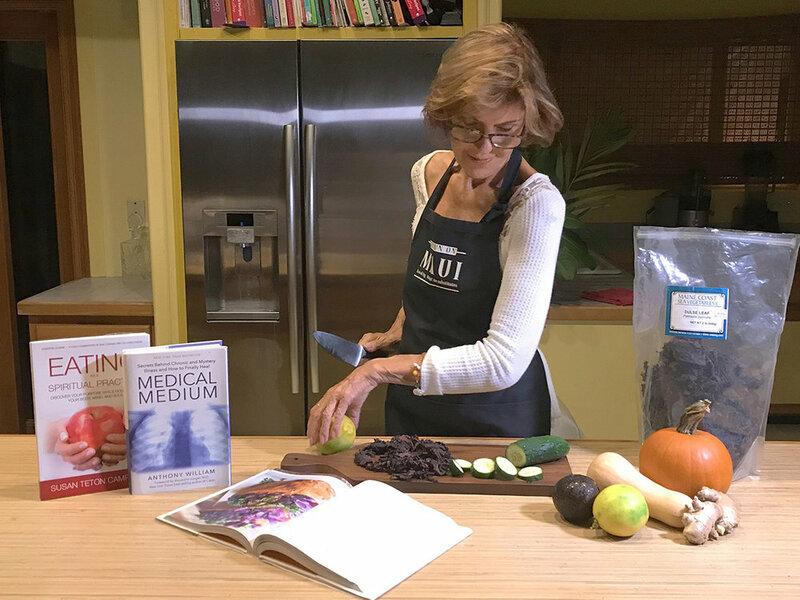 I promise this course will awaken and inspire you with a diet delicious enough to last a lifetime.At age 67, I finally found the right combination of Raw, Cooked, and Cultured Foods. Join me as we journey ahead with strength, vitality and fun. Just launched and on sale now.Click here to learn more. Save Money & Eat Healthy Too! Spend time at home with friends and family learning to cook. This is truly the most fun way to cut your food budget, gain new skills, socialize and become healthy too. Turn a problem into an opportunity!! 1. Make a dedicated decision to Go Green with your diet. Healthy food is really less expensive when you make a commitment to give up prepared foods – foods from the factory and foods in fancy packaging. 2. Buy local produce and other foods from your farmers market. Pick up seasonal greens, fruits, herbs, spices and other local food products. This is also a great way socialize and teach your kids to shop. Call friend and have them meet you. If your budget is too tight for anything extra like a hot drink or prepared lunch at the market, bring your thermos full of something wonderful and bring a snack (ideas below). 3. Shop in Bulk. This does not mean Costco or big box stores. It means to find a store within your area that offers foods in big bins that you bag yourself. Purchase a handful or several pounds. Most natural food stores have great bulk sections that carry, to name a few: flours, grains, rice, legumes (lentils, Mung beans, Chick peas), beans, cereals, nuts, sugar, dried fruits, and much more. With all this food in bulk, now you have to start preparing and/or cooking. This is the time to bring in the family members to learn together, or visit with your favorite friends. If you live solo, then invite a friend over or put on a movie and learn to make something new. 4. Eat lower on the food chain. If you want to eat fish, meat, and poultry, which can be much more expensive than beans and legumes, then do so more sparingly. Most people overeat protein from animal sources anyway, and it is said that it is healthier to eat less animal products. Studies show there is less risk from most major diseases if red meat and foods full of saturated fats are used sparingly in the diet. The Centenarians, those living to be 100, live on an 80% plant based diet. So, this is an opportunity to save $ and create better health. As for socializing, here is an opportunity to have vegetarian potlucks. To learn how to eat lower on the food chain and cook from bulk, visit: http://www.chefteton.com/products/dvds 5. Shop once a week if possible –twice for fresh produce. The more times you shop the more you are likely to buy. I personally love going to my local natural foods store. But if I am practicing prudence with my budget I am better off to clean out my food stash before I buy again. Although mail ordering specialty foods may not seem economical, it can be if you order ahead. If you have the highest quality foods available, you will most likely save $$$ by being prepared. 6. Get a crock-pot if you do not already have one. They are so inexpensive and great for soups full of Mung, lentils and other legumes, veggies, potatoes, squash, and powerful herbs. Crock-pots are a great way to save time. It cooks the food slowly, preserving flavors, while you do something else. 8. Planning ahead will save you money. No doubt about it. For instance. Plan a meal with enough leftovers for lunch the next day. Pack and go is a must. Have a small cooler ready and make a habit of slipping some food in before you leave the house. When you are out and hungry, you will be prepared. Take nuts, seeds and dried fruit if you have nothing else. If you work at a place where there is a kitchen, stock it with essentials so you can make your own lunches. Get a hot plate if needed so you don’t have to use microwave. Always have a liquid on hand. Make your own coffee, carry tea bags, and a reusable water bottle. Small food purchases add up to big spending. Be prepared and you will save $$. 9. As for dairy, RAW is best. If you are lucky enough to have raw dairy in your area, it will probably be more expensive than conventionally produced dairy. But, Raw dairy is known to be extremely nourishing. Many people who have allergic reactions to conventional dairy actually receive healing benefits from raw dairy products. You can make your own yogurt and kefir and cultured vegetable, which would be fantastic for your own inner eco system. For further information about the benefits of cultured foods, visit: http://www.chefteton.com/articles/cultured-foods. For more info on /raw dairy go to: www.organicpastures.com. 10. Eat for nourishment. If you eat high quality – nutrient rich food you will not need as much and I guarantee you will enjoy it more. It is not a good idea to skimp on nourishment. Instead skimp on empty foods that might have been called “treats” in the past. There is a way to nourish and have pleasure at the same time. Put your money where your mouth is. Learn to make quick and easy sauces and dressings for vegetables and salads! !